I am slowly morphing into a woman who I don’t recognize. I never thought I’d be such a homemade person. Ya know what? It’s pretty awesome! 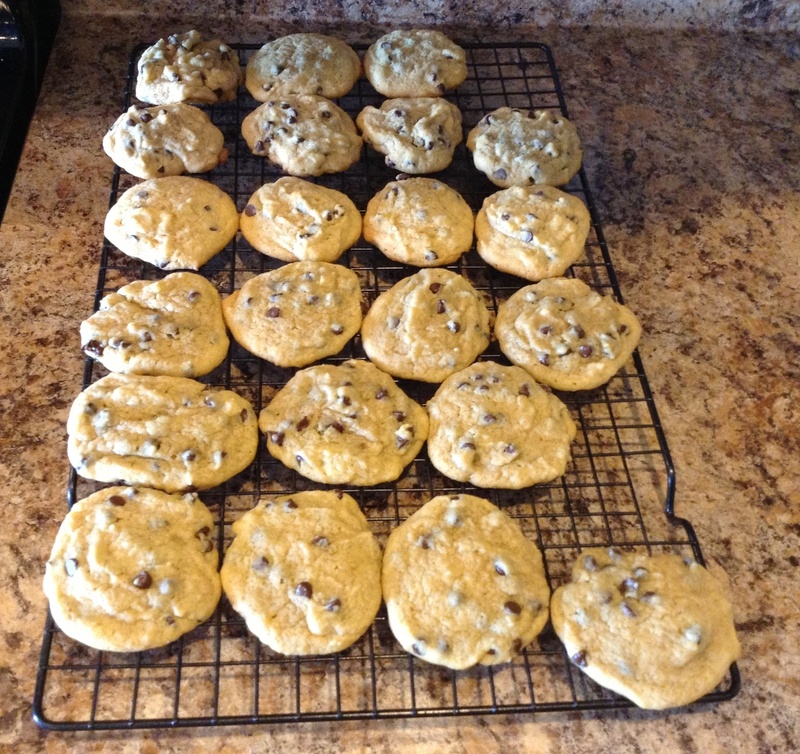 I am loving all of the new recipes and things I’m finding that can be homemade (mostly thanks to you Pinterest!). Some of that might make you scratch your head and wonder what’s the big deal? But when the Huzz and I got married, I did not cook. At all. Unless you call heating up those frozen bags of food for dinner or dumping a jar of spaghetti sauce over frozen ravioli cooking. And cakes and cookies? I let Publix do the baking for me! So for this little lady… well, let’s just say, I’ve come a long way baby! I also made these AMAZING peanut butter bars. Man oh man! We were all “Mmmmmm-mmm-mm” and “Oh these are so GOOD!” while we ate them. (If you have a peanut allergy, try subbing your favorite peanut butter sub.) I will make these again! They do have a lot of powdered sugar, so this isn’t an every day treat. Still, this recipe also inspired me. Last night, SG wanted a treat and we were all out of treats. I decided to try my hand at kind of recreating both of these recipes together. I didn’t even look at the recipes. I just threw in a little of this and a little of that. I didn’t write the recipe down either as I made it. This is my best guesstimate, as I only measured the oats. I did write it down shortly after making the bars, so I think these measurements will work well. The next time I make these, I’m using these measurements. Use Earth Balance vegan butter to grease a medium sized pan. I have a brownie pan. It’s bigger than an 9×9 but smaller than a 9×12. I think any of those pans will work- it will just affect the thickness of your granola bar. Put oats, almonds & raisins in a medium sized bowl. Give it a quick stir. 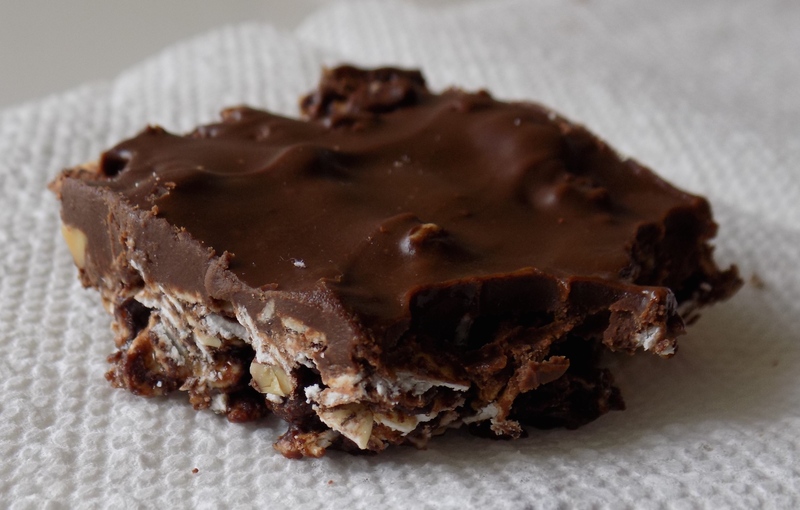 Melt the chocolate chips for the granola bar in a microwave in 15 second intervals. Check it each time so you don’t melt it so much the chocolate hardens- I think it’s called seizing. Add the honey to taste to the granola mixture. Mix well. Honestly, I squeezed some in, mixed the granola mixture, tasted it, and then squeezed in more. Add the chocolate topping ingredients to a small microwave safe bowl. Heat in the microwave in 15 second increments, until all is melted. Stir until well blended. Pour the melted peanut butter and chocolate over the granola mixture. I poured it in little rows. Try to distribute it evenly. Take a spatula and smooth out the chocolate topping- going all the way to the edges. Pop in the freezer for an hour and then enjoy. Store it in the fridge. I have no idea how long this lasts because we’ve eaten almost all of it in less than two days. 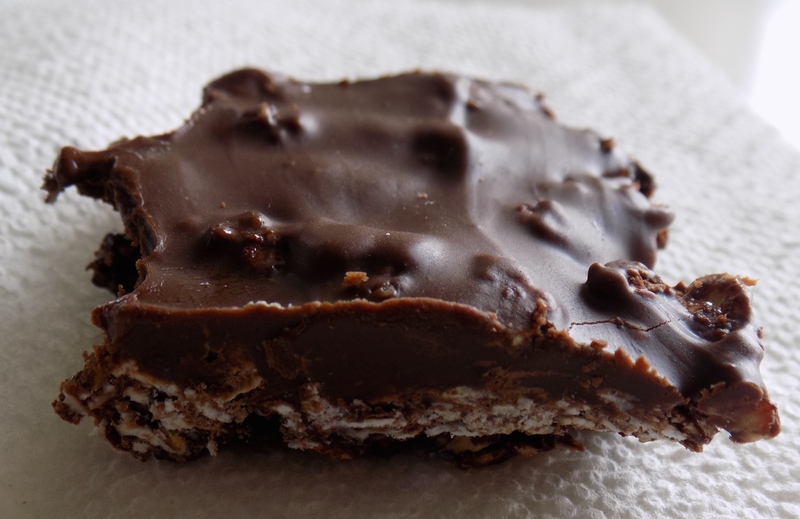 Note: The next time I make these, I’m going to add some Enjoy Life Crunchy Flax cereal to the chocolate and peanut butter mixture once it’s melted, but before I pour it on the granola bars. I think it will give it a nice crunch. The family’s take? They loved it! 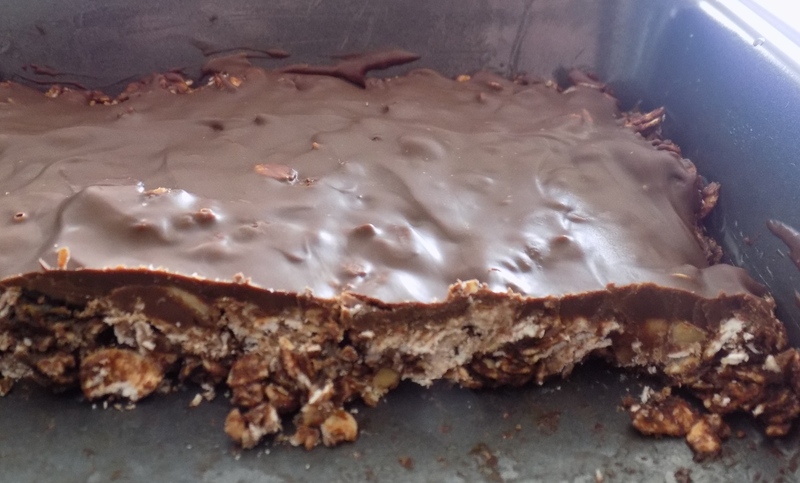 The chocolate and peanut butter topping elevate the granola bar to tasting a bit more like a treat- while the oats, peanut butter, almonds and raisins make me feel good about giving this treat to the 2 most precious people in my life. Granola bar with four year old bite marks.